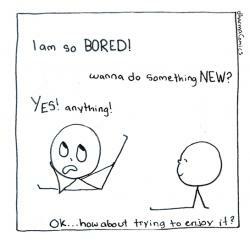 Seed questions for reflection: What does "boredom" mean to you? Can you share a personal story of a time when you challenged your thought of boredom? How do you liberate yourself from the chase of the next new thing? Boredom is aversion to neutral sensations. It can be conquered by observing those sensations with equanimity. Really excellent! I am sharing this with others. I've been looking at the concept of "letting go" for many years. (I co-authored A Rumor of Angels: Quotations for Living, Dying & Letting Go) For me, in part, letting go is submitting my day to God every morning. I keep very busy, but it's because I like all the things I'm doing, whether it be writing, designing, being with people, walking...), not because I'm looking for something to distract me from myself and keep me from boredom. Oh, how I used to have a problem with that. Thanks for your well-written piece. One of my first lessons in my perceived boredom, and announcing it to the world with a big sigh, came from my mother. I must have been around 10 years old. It was summer. My best friend was on vacation somewhere so, of course, I believed I had " nothing " to do. I was moping around the house, whining and sighing " MOM... I'm SO bored !" over and over...plopping down on the sofa...sighing again...changing chairs...being an obnoxious " bored " 10 year old. My mother, who was never bored...was in the kitchen, probably making tuna fish, wasn't responding to my exaggerated theatrics, was just doing her mother thing. Finally, after listening to my lamenting for, god knows how long.., ( and she was a patient woman ) I heard her on the phone with our older next door neighbors. " Norma, it's Ida. Would it be alright with you and Jack, if Randi came over and mowed your lawn. She's walking around the house complaining she's bored with nothing to do. " WHAT !!! Sparing you the details...soon I was mowing their lawn, raking up the mowings, edging the sidewalk and thinking about HOW I had gotten in this position... But Nawney, as I called her, was bringing me out lemonade and cookies, telling me to "take a break, honey, " and Uncle Jack, as I called him, was coming out and telling me what an excellent job I was doing, and how much he appreciated for " wanting " to do this for them. And pretty soon I was feeling good. I definitely wasn't bored. And what I learned at that young age and continue to do to this day is that there is always something to do and someone to help. And all I have to do today is walk outside or pick up the phone. There is always something to do, someone to help or a phone call to be made that might simply bring a smile to someone's heart. After returning home, that's just what my mother told me. " You were given the gift of waking up and the ability to get up...so don't waste it by plopping around this house doing nothing but complaining. Because if you can't find something to do...I will find something for you to do..." now, go wash up, come sit down and have some lunch. While I was mowing their lawn, my mother had made me macaroni and cheese (extra soupy). My favorite ! More delicious proof to me that, every day, there is always something to do to make someone else feel good. Sometimes it is called paying it forward but my mom called it, paying it back. Paying life back for this incredible opportunity to be here. Boredom is a subjective experience of doing something that has no intrinsic connection with me or meaning to me.When I feel disconnected with any activity, task or a person I feel bored. At this time I become mindful of my feeling of boredom and make an existential response. This response varies. There is no one standard and fixed response. I turn another page of the book or skip something not interesting me. I withdraw my my mind from the superficial participation in the activity or the shallow presence of myself in the conversation. I take boredom as an opportunity to understand why I feel bored and make a conscious choice. I do not like to pretend that I am interested in what is going on. Taking such steps mindfully makes me more authentic both in personal and social context. I stay with boredom if it feels right to stay rather than withdraw. pretend or deny.Mindful processing of boredom has helped me o learn more about me. In that case, boredom becomes a gift to me to work on myself. I do many apparently boring tasks mindfully such as cleaning pots and pans and dishes and going to grocery store, I see the value of doing them to help me and others and to serve them. These tasks take a different meaning and I do them joyfully. The tasks become purposeful as I change my perspective. This shift in perception is very beneficial to me. I have fond memories of fetching water from the well and helping my mom wash clothes. I cherish those moments-the moments of having quality time with my mom and serving her. In a large family consisting of four brothers and three sisters, having such a quality time was deeply meaningful to me. Such experiences have planted precious seeds in me and have impacted me deeply. Mom! I am very grateful to you. When I am in a meeting and I sense the boredom arising in me, I take a mental nap and let me my mind and brain rest. At times I let people know that I am feeling bored and check with others if others feel that way too. This happens when the person in charge of the meeting keeps on harping on the same topic as if we have not heard him or understood him. On such occasions, I let the person know politely how I feel and can we move on to another item on the agenda. I personally feel that I need to give constructive feed back compassionately and politely. I like to be authentic and compassionately assertive rather than faking and being aggressive.This way of dealing with my boredom helps me to be myself and maintain connection with me and with others. As always, I am grateful to Nipun and others for giving such weekly gifts to reflect, communicate and get connected with all of us. I enjoyed this article and reading other peoples responses. And for my two cents boredom is on the edge of depression. Because of my physical limitations where my cells do not produce energy for my muscles and normal walking is exhausting boredom is frequent. My disease is eight years old and it is only this last year I started digging into my sense of boredom as nothingness. When I feel my emptiness and the void from within I can sense this temptation to want to cut my arms and legs with a knife. There is something from within me that wants to escape this crushing negative consciousness. It feels like there was nothing in the world I can identify with, nothing true or valuable in which I can believe in. There is nothing I could attach myself, which creates this attraction to want pain in my darkness. My human nature abhors this boring hole. Something from within has allowed me to step into this being on edge with my boredom and it felt like I was walking off the edge of the world. In my edginess I have felt death and the experience of my personality is at its end. I also felt this need to make a leap of faith from the known to the unknown. Yet I could not understand making this leap when my boredom revealed itself as my value being nothingness. Just sitting around, completely empty and bored, I could feel my nothingness and groundlessness express a faithless faith. From this arose this stillness and peace. It is then I realized I was the observer and the observed, the experienced and the experiencer. From what I can tell when the experience becomes one with the experiencer and stillness falls into peace then my boredom and emptiness will be the Essential self. The true self will reside in non-attachment and then the moment can arise and disappear into profound stillness and peace. I just need to say, this downward spiral and meaninglessness almost brought about my rejecting attachment to anything. Yet it is on this edge where faith counteracts the terror and despair. Stepping into boredom, a walk-less walk, where death is felt as nothing, the true self turns it around into stillness and peace. This must be an expression of the Divine. A boring death maybe is a symbol of my entire psychological orientation and feels like just a place to begin. Sometimes because my cells are not working right my mental connections go haywire and it feels like a consuming craziness. This place is also down right mean. From this you may tell my stillness and peace is not very good and it feels like I need to find peace with death without being able to die. So if anyone has more insight on this stillness/peace and can provide a key to understand the whole I would appreciate it. I feel hyperactive mind is prone to boredom. Also dissatisfaction also becomes a cause of obsession. I think, mostly what we do in life, we do, to get rid of boredom. We like to fill up all our time except when we are asleep, with some activity and would never l;ike to be not doing something, physical or mental. This is because of our conditioning. Idleness, mental and physical is taboo. However it is essential that we come to terms with boredom. Boredom if understood, not pushed away can be liberating. Boredom without guilt is probably the only way we can relax. To be without interest in the people, subject matter, project at hand is to be "bored". My parents remedied "b" with work. If we verbalized "b", we would find ourselves scrubbing the porch, cleaning the garage or weeding the garden. This plan worked quite well! All my siblings have developed interests beyond what we have time to pursue. blessings and amen to those who have already responded. I look forward to your weekly insights! An amazing insight with huge implications. Thank you for bringing it up. Boredom means to me that I'm not doing what I want to be doing, be that because I or someone else isn't allowing me to do what I want or because I don't have the means, motivation, courage, or whatever. A person can fake boredom as a way of being uncooperative, but that's not real boredom, that's passive aggression. The way to be bored is to not do what I want. "Follow your bliss," said Joseph Campbell, which means pursue what you really want and what you really turn on to. Commitment, hard work, and sacrifice are usually still part of doing what I want. If I'm not doing what I want, my commitment, hard work, and sacrifice may bring some satisfaction but deep down I'm likely to still be bored. I've been in many situations that have been boring for me. Sometimes I've done nothing, stayed bored and got angry. Sometimes I've removed myself from the situation altogether and tried to find a different situation. Sometimes I've made changes in the way I am and the things I do in the situation, sort of redefining me and the situation. The last option has been a way of liberating myself from the chase of the next new thing -- sometimes that's been the best thing for me to do.